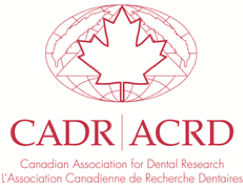 The Canadian Association for Dental Research (CADR) along with the Association of Canadian Faculties of Dentistry (ACFD) are pleased to recognize exceptional contributions to dental research at Canadian Universities through the creation of the inaugural CADR/ACFD National Dental Research Award. The award is open to any faculty member currently performing research who is a member of CADR in the year nominated and who holds a primary faculty position within a Canadian Dental Institution. The recipient of the award should demonstrate a significant contribution to the field to oral health research, exceptional knowledge of their field of study, an outstanding record of mentorship to trainees, and a profound effect on the current knowledge of an area relevant to oral health. This year, nominations for this award will be accepted up to November 1, 2018. The winner will receive a $2,500 prize and a certificate from the CADR and ACFD to be awarded each year at the CADR national or international meeting. The inaugural award will be given at the 2019 CADR/ IADR meeting in Vancouver, BC. For further information on the award, as well as a nomination package, visit the CADR Awards webpage: http://www.cadr-acrd.ca/index.php/awards. Only one nominee may be nominated from each dental institution.